The index opened flat but saw huge unwinding from the morning itself and closed weak below 7800 at 7783.40, huge loss of 86.75 points. The broader market was weak with 436 advances to 1105 declines. Range for the series is at 7700-8000. Call option 7700-8200 added huge 54.16 lacs OI with profit booking at 8300 and above strike prices. 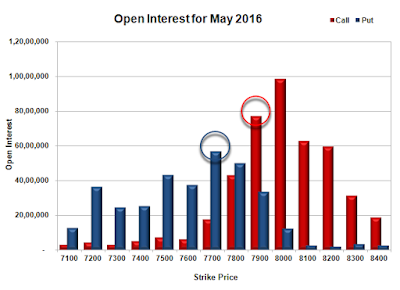 Put option 7600-7500 added 1.96 lacs OI with short covering at 7800 and above strike prices. Nifty Open Interest is at 1,64,99,400 up by 4,07,700, with decrease in price, probably short build-up. Bank Nifty Open Interest is at 17,30,280 down by 11,280, with decrease in price, probably long liquidation. FII’s sold 4774 contracts of Index Futures, which includes net 3105 contracts long liquidation and 1669 contracts short build-up, with decrease in net OI by 1436 contracts, includes 35394 longs to 40168 shorts for the day. FII’s Index future open contract as on date is 142848 Longs to 129148 Shorts, Net 13700 down by 4774 contracts. Initial and best support at 7700, with OI of 56.76 lacs and below that at 7600 with OI of 37.47 lacs. 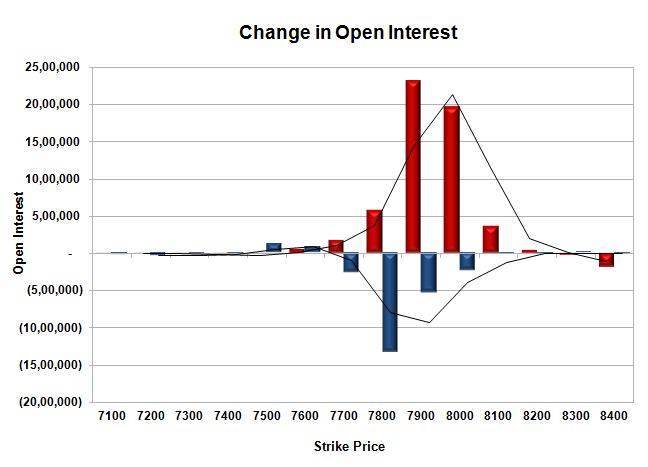 Initial resistance at 7800, with OI of 43.02 lacs and above that at 7900 with OI of 77.17 lacs. 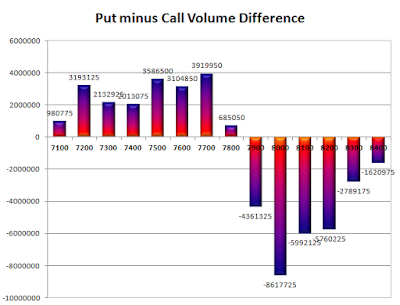 Day Range as per Option Table is 7733 - 7870 and as per VIX is 7714 - 7853 with 7809 as the Pivot.